Green colored, algae infested pool from the Rio Olympics is fresh in everyone’s mind. This overnight growth was linked to lowered pH blamed caused by the lack of buffers. When pH drops, apart from increasing chances of algae growth, metal fixtures are also corroded. It is common to notice discoloration of pool water or stains along the tiles. While most stains are removable, there are few adamant ones that get lightened but never fully erased. Hold the urge to start scrubbing every time you see a stain. Evaluate the water chemistry first. Ensure that the water is well balanced. Most stains appear when the pH drops resulting in disintegration of metal pipes. Stain removal approach depends on the color of the stain. To remove greenish blue stains from clear water, use citric or ascorbic acid directly on the stain. This coloration is caused by release of copper from certain microorganisms or from pipes. You can additionally add a chelating agent like phosphoric acid. In situations when the water is cloudy, the most common reason may be algae infection. 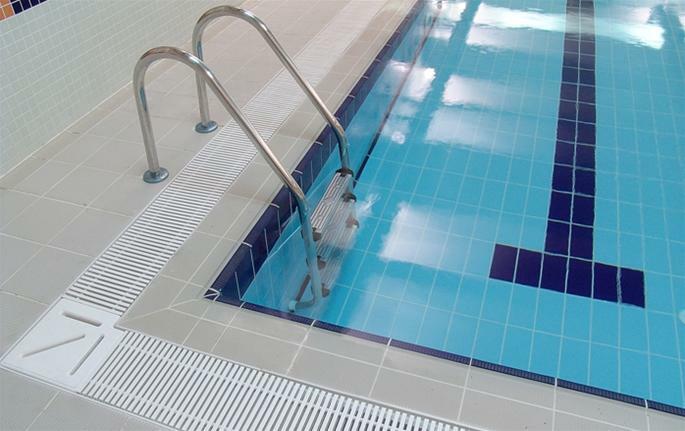 Purple precipitate on the swimming pool tiles in Singapore and water surface is removed by lowering the levels of cyanuric acid by draining out the water. Replacing the pool with fresh water also tackles the copper solution. Purple coloration occurs when copper cyanurate levels reach over 100ppm. When brown stains occur on the surface of the water, it is mostly because of dissolved manganese or iron. The main culprits are lawn fertilizers and pool heaters. The only way to remove these stains is by draining out the water and replacing it with fresh water. Leaching out can be avoided by regular use of sequestering agents like phosphonic acid. Brown stains in the shape of a leaf are generally caused by debris. These stains disappear when the chlorine levels are established. You can also add citric acid or ascorbic acid to remove these stains. Stains caused by metal corrosion can be easily lifted by using zinc anodes and non-phosphorous chelating agent. Pool stains have a specific cause and a mode of treatment. They cannot be generalized and tackled the same way. Some stains are easier to remove than others. The material of the surface stained also determines the ease with which it can be scrubbed off. To maintain a healthy pool, regularly check the pH of the water and add sequestering agents.